Increase energy, lose weight, decrease stress, detoxify the body and purify the skin while elevating the immune system to fight off everything from the common cold, circulation, asthma, bronchitis and other respiratory conditions. Treat yourself and look good. Feel good with our luxurious pampering treatments especially for you. wherever you feel you need. Your health and well being is as important as the other things in your life, such as your family, your home and your friends. We use a holistic approach, using various combinations of therapies in order to promote your physical, spiritual, emotional and mental health and well being and have been doing so for many years. This is what we call MindBody Therapy; helping you to relax, heal and live life to your fullest. We’ve also extended our range of well being products in the shop, to include items such as incense; essential oils; apple cider vinegar; herbal teas; epsom salts; himalayan salts; chakra stones; sage; burners; salt lamps; crystals, plus more, so pop in and have a browse. People come to us for varying reasons; sports injuries; runners preventative maintenance; pampering and relaxation; luxurious treatments; detox; shifting energy; to relieve aches and pains; recovering from illnesses; destress; rebalance; life changes. Our treatments range from various types of massage including deep tissue; beauty; reflexology; reiki to life coaching and hypnotherapy, thus covering the mind and the body. 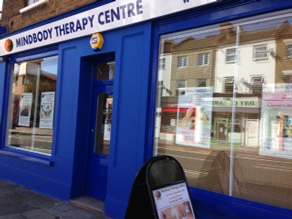 We aim to offer a professional service to you and as such, all the therapists within MindBody Therapy have been interviewed and hand-picked for their quality, delivery of service and experience in their field of expertise. They are fully qualified, trained and insured. We also have our own in house CThA approved Advanced Massage Therapist Trainer. For those claiming back from your health insurance, we take doctors referrals and can offer treatment receipts for those of our therapists who are qualified under HCPC or those qualified under CNHC. Read more. If there was a way to increase energy, lose weight, decrease stress, detoxify the body and purify the skin while elevating the immune system to fight off everything from the common cold, circulation, asthma, bronchitis and other respiratory conditions to serious life quality threatening illnesses, what would it be worth? Book in to use our sauna and find out more. *ongoing offer – see more under Offers .